Please visit www.aladdineventcenter.com for rental information! 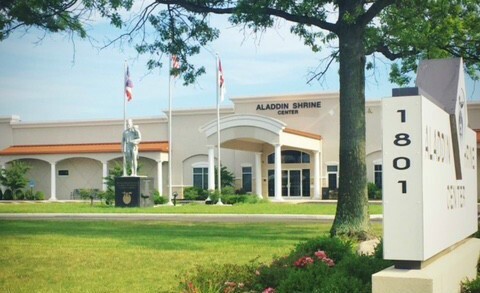 The Aladdin Shrine Center is located in Grove City, Ohio, a charming small town with a big-city feel. Rich designs showcase the perfect details for your special event. From smaller business meetings to larger wedding receptions, any event will fit perfectly within the Aladdin Shrine Center. Boasting over 26,000 square feet, beautiful architectural features, large windows, elegantly designed entryways, and a private patio and gazebo, the Aladdin Shrine Center offers plenty of space for you and your guests! Whether you are planning a wedding, anniversary, birthday party, corporate event or another event, the staff at the Aladdin Shrine Center want to help make your experience a great one! We will work with you from the initial planning stages, to guest accommodations and travel, to the final minute of your event. Please contact Kristin Baisden, Event Coordinator, if you would like to schedule a tour!